Do you intend to make a change and move to the South of France? 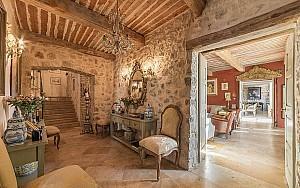 Check out PALM REAL ESTATE’s offers and discover the houses to rent in Grasse France presented on our website. Opting for a villa to rent in Grasse you will choose to enjoy the life of Provence, the ideal climate, the peaceful and quiet atmosphere of this area. Rewarded in the competition of flourishing cities and villages, Grasse is also known to be the world's perfume capital. The three major perfume houses Galimard, Fragonard and Molinard began and developed their business in this village. An international perfume museum was also founded in Grasse in 1989. Choosing from our Grasse rentals, you can also enjoy the nature in this region with large forest areas. Whether you enjoy walking through the olive groves and lavender fields or swimming in the Mediterranean, rent a luxury villa in Grasse which is located only 20km from the sea, and you will have the opportunity to practice various open air activities. All our villas in Grasse France are situated on the hills and are equipped with lavish landscaped gardens and pools in which you can fully enjoy the quiet and ideal climate of the French Riviera. All are newly built or renovated and feature large living areas, several bedrooms with bathrooms and many other luxury options to satisfy our demanding clientele. Contact us if you wish to rent a luxury villa in Grasse. Our team of professionals in luxury real estate in the south of France is eager to help you find the villa for rent in Grasse that fits your needs, your expectations and your budget. If you don’t find what you are looking for here, we can also offer you numerous other possibilities elsewhere on the French Riviera.